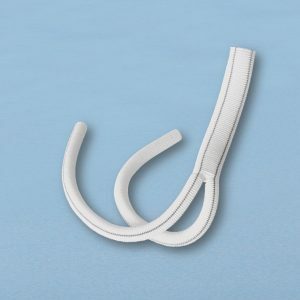 Dallon® H is a non-sealed vascular graft which can be easily sealed with patient's own blood. The implant is manufactured from polyester fibres of high cristallinity degree. The product is biologically inert. The graft is composed of double-sided velour manufactured with knitting technique out of polyester yarn. The product is available in two versions - the prosthesis can be either straight or bifurcated. healing-in process starts directly after introduction into blood circulation system. Dallon® H graft is intended for reconstruction or replacement of damaged or affected blood vessels. Dallon® H vascular prostheses are offered sterile.